Becoming Self-defined Leaders means learning to lead from within. The programs offer effective concepts and strategies for self definition. A self-defined leader has internal conviction, confidence and integrity. The model below depicts the specific outcomes and gains from experiencing the components of the Self-Defined Leadership programs. It is often stated that Emotional IQ is the greater predictor of success than regular IQ. 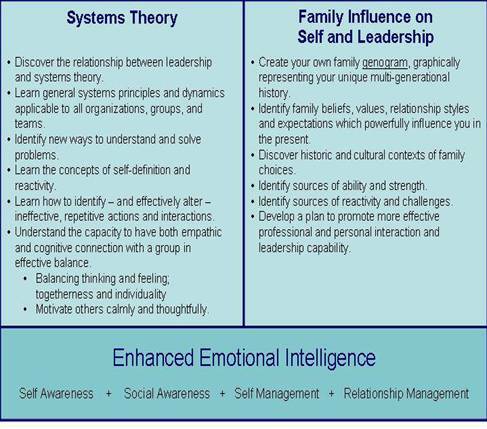 Through the exploration of systems and family in the Self-Defined Leadership programs, participants gain the added benefits of self awareness, social awareness, self management and relationship management which are all components of Emotional IQ. Effective leaders are aware of the systems around them – how their organization is functioning, the external influences on the organization and the role of individuals – and oneself – within the whole system. This gives them the information they need to make reasoned decisions about how to act and how to improve the organization. Self=Defined Leadership invites you to explore the dynamics of teams and the systems theories behind it. We inherit our views about the world, expectations, roles and much more from our family. Yet, we are never invited to examine the details of our inheritances. Our loyalty to our family often keeps us locked in roles that are not necessarily to our advantage. Analyzing the rich heritage and learnings from our family creates opportunity for new understanding ( often many “Aha” moments) and a freedom to define ourselves. Self=Defined Leadership programs use a unique tool called a genogram to accomplish multigenerational explorations. Leaders must also acknowledge and appreciate diversity. Being led to think about systems and one’s family of origin creates an opportunity to understand the diversity of cultures and experiences that others bring to their roles. This opportunity enhances team work through promoting interpersonal respect and clarity in relationships.